Yellowstone family run up Washburn. 2018 Leadville Trail 100 Run. Two years ago Adirondack Sports had the privilege of highlighting Bill Hoffman’s unconventional path to the sport of running. In this first article (adksports.com/2016-09-athlete-profile) Bill discusses that he lived an active lifestyle as a youth in Florida, spending much of his time surfing or skateboarding. Bill’s first experience with running came during a summer physical education course when boogie boarding was cancelled, due to liability, and turned into a running program. Participation in the running program led to acute Achilles tendonitis and a visit to the doctor where Bill was advised that he had flat feet and should not pursue running. Bill, like many individuals, went about his life building a career and family following the advice without a second thought. Had things turned out differently Bill’s story would have still been significant. In the 20-year interim Bill earned a graduate degree, left a job in industry at GE, and became a founder and CTO of the company Kitware. The previous article discusses how Bill was inspired by the book “Born to Run” by Christopher McDougall and “Barefoot” Ted McDonald – a barefoot running advocate who founded the company LUNA Sandals. Bill’s transformation took him from a moderately out-of-shape armchair adventurer to a barefoot mountain and trail adventurer. Bill’s adventures saw him completing marathons and ultramarathons over rugged terrain and at punishing elevations. In order to fuel this new lifestyle, Bill changed his diet and began completing training runs in the mountains of Lake George and the Adirondacks – often prior to a day’s work. Bill’s life changing experience had a positive impact on the rest of the family as his wife and children began eating healthier and exercising more. I met Bill while planning a winter hike in the Adirondacks just before New Year’s Day 2018 with a group of running friends. The plan was to hike two high peaks, Giant Mountain and Rocky Peak Ridge, although everyone was keeping a close watch on the weather. A phenomenon known as “bombogenesis” was producing a particularly punishing cold stretch and our plans were up in the air. Despite better judgement, our group of five met at the trailhead to Giant Mountain at 7am on Dec. 28 with the temperature reading -20 degrees. After very brief introductions we began to move along the trail. Bill quickly moved to the front of the group and I kept pace right behind. What stood out to me was that Bill’s sharp contrast to the rest of the group. Bill seemed underdressed for how cold it was and he appeared to be wearing wool socks, sandals, and microspikes on his feet. Start of Boston Marathon 2017. As the hike progressed our group split into two smaller groups with Bill and me out front moving faster and separating from the rest of the group. Our conversation would cover a variety of topics but running and hiking were two that would consume much of the time. Because I was wearing a full neoprene facemask and had goggles with me, it seemed easier to ask Bill (who was simply wearing a hat) questions, and try to decipher what he was saying. Naturally the first thing I questioned Bill about was his choice of footwear. This barely seemed to faze him as he began telling me about the doctor who diagnosed him with flat feet, the decision to run again, and to try running barefoot or with sandals. We had a long discussion about the pros and cons of running barefoot or with sandals. Bill also discussed the fact that building up his ability to run barefoot over time had vastly strengthened the muscles in his feet to the point where it now seemed like he no longer had flat feet. During the hike Bill mentioned doing many of the same races I had run over the years, including the Boston Marathon, Utica Boilermaker and Stockade-athon. Then there were the ones that I had heard of but not yet done, including Wakely Dam Ultra and JFK 50. Finally there was his tale of running the Machu Picchu Marathon (covered in the last article) and Manitou’s Revenge 54-mile ultramarathon in the Catskills – a combination of Escarpment and Devil’s Path, and attempt to get into the Leadville Trail 100 (mile) Run. Bill was clearly a serious runner and hiker, and given his decision to travel very lightly was moving at a pace that was difficult for me to keep. By this point in the hike we had summited Giant and had stopped at the junction between Giant and Rocky Peak Ridge to wait for the rest of our group. My suspicion that dressing so lightly could be a liability was confirmed when Bill requested we keep moving to stay warm. Although that was the extent of his complaint I was secretly coming up with a game plan that would allow us to get him off the mountain without freezing to death should something happen?! (Bill did have a down jacket in his pack if needed.) Luckily the rest of the hike was completed without any difficulty and we were able to leave with some great pictures. Shortly after our hike I was able to go on a winter training run with Bill at Moreau Lake State Park. The 15K loop that we took was one that he does frequently in all seasons. The terrain and elevation profile of this area make it a great place to run in preparation for longer trail races. On this occasion there was fresh snow and the sneakers I chose were a bit narrow for the microspikes I was wearing to help grip on the snow and ice. As I had to keep adjusting my footwear I was surprised to see that the LUNA Sandals Bill was wearing were wider than an average shoe and caused no such problems. During this run Bill discussed his spring and summer racing schedule. The goal was to run the Leadville Trail 100 Run if he got into the lottery. 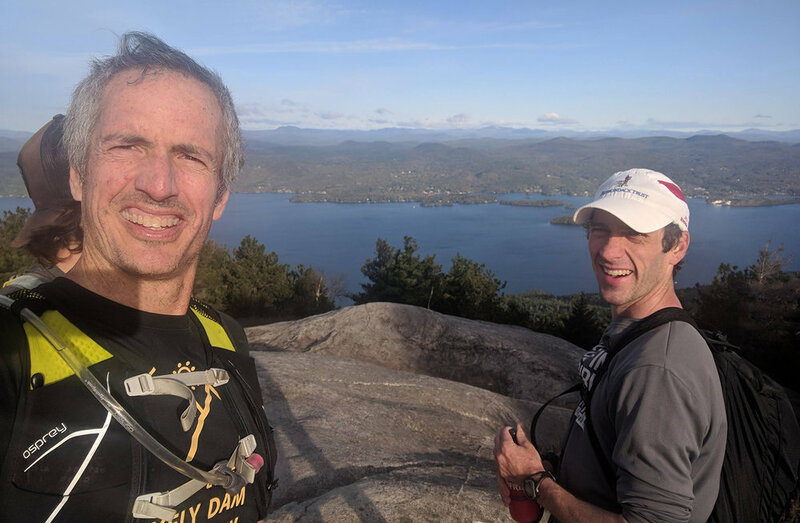 In addition to many training runs at Moreau Lake, Lake George and the Adirondacks, Bill would prepare to race by running the 7 Sisters Trail Race, Manitou’s Revenge, and Wakely Dam Ultra. Shortly after this training run Bill found out that he got into the Leadville Trail 100 Run. Fast forward to May and I had just completed the New Jersey Marathon. This was the first marathon I had completed in over two years after returning from an injury. 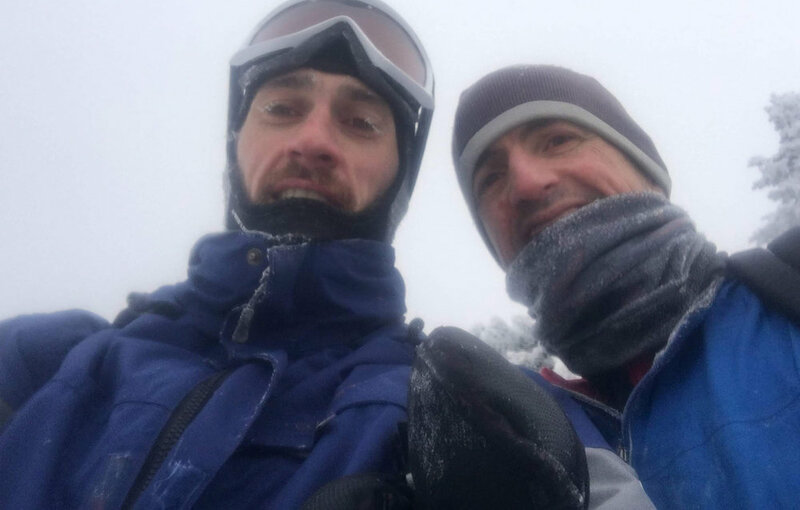 In the preceding months, I had the opportunity to join Bill on another couple runs at Moreau Lake, and we had attempted to plan a run in the Adirondacks without luck. At this point Bill invited me to join on a training run in Lake George that would cover approximately 30 miles of trails and would take us to the summits of Buck Mountain, Sleeping Beauty, Black Mountain and Erebus Mountain. I decided to join and it was during this run that I began to question Bill more on his plans regarding Leadville. I decided during this run that Bill had a good game plan, and based on his training and racing plans, had a good chance of completing Leadville. Based on this I decided to ask Bill whether he had considered pacers. We began talking about the logistics of the trip and I officially joined what would become “Team Sandal” as one of Bill’s pacers. As I flew from Albany to Denver on Wednesday, August 15 I began to contemplate how the next several days including the race would unfold. After landing in Denver, Bill’s wife, Naomi, and I met another team member and pacer Matt Turek, and we loaded our rental car and set out to Aspen to meet up with Bill. He had arrived about a week earlier to help with the acclimation process. Our elevation gradually increased to 10,000 feet as we got closer to Leadville and I began to wonder if the altitude would affect me while pacing Bill. After a restless night’s sleep in Aspen and a very easy run around the trails on a local ski slope, I was sure that the altitude would have an impact on me, but I was hoping the pace would be such that I would not be hindered in pacing Bill. “Amigo Grande” with Barefoot Ted in Leadville. A confluence of events leading up to the race morning served as subtle affirmations that things would work out. Bill’s attempt at Leadville would come eight years after his transformation into a barefoot ultramarathon runner. During the packet pickup and athlete informational meetings we learned that parts of the movie “Born to Run” were being filmed and would continue to be filmed during the race. Finally, Bill met with and ran with one of his longtime inspirations – Barefoot Ted. The day before the race, Barefoot Ted came up to Bill and anointed him an honorary member of “Amigo Grande,” and bestowed a LUNA necklace on Bill. It seemed like everything was coming together well and we had a little extra luck on our side. The 36th edition of the “Race Across the Sky” went off on August 18 at 4am. There was a noticeable excitement in the air as 713 runners, including Bill, set out on their journey in the midst of the Colorado Rockies. Our crew of Naomi, myself, Matt, Doug (Bill’s cousin) and Dan (our third pacer and LT100 alum) regrouped, and ate a quick breakfast before heading out to the first outbound crew station at 25 miles. The race course follows 50 miles of forest trails and some mountain roads from Leadville out to Winfield Campsite before turning around and heading back. Therefore each checkpoint a runner is seen at is designated as outbound for the first 50 miles and inbound for the second 50 miles. Pacers are allowed after the 50-mile point for route finding, keeping the runner on pace and eating/drinking, and making sure the runner leaves aid stations with adequate clothing/supplies. At 25 miles runners were just coming off a stretch known as Powerline. This portion of the course climbs to the second highest point on the course at 11,400 feet, before descending along a trail that has power lines hanging overhead. Upon entering the aid station area, Bill found us with little trouble and seemed to be in good spirits, stating that he “had a blast running down Powerline.” After a quick break for refreshments, we got Bill off to start the next segment of the race with little fanfare. From here the next 12 miles would take Bill over rolling hills and some rugged sections before reaching our second aid station at 37 miles in an area known as Twin Lakes. As with the previous aid station, Bill arrived on the approximate time schedule we had planned, and was still in good spirits. This was an important point in the race as we prepared Bill to tackle what is considered the toughest stretch of the course. After leaving Twin Lakes, the course follows the Continental Divide trail on a sustained 3,000-foot climb through Hope Pass, between Hope and Quail mountains. The climb reaches the course’s maximum elevation at 12,500 feet, before descending 3,000 feet below to the race’s midway point, in the ghost town of Winfield. After arriving in Winfield I began to ready myself for the task at hand. My goal was to help Bill make it from Winfield, up and over Hope Pass for a second time, back to Twin Lakes to pick up our second pacer. Before traveling to the race my neighbor had said his brother had tried to run Leadville a few years ago. My neighbor’s brother must have stated somewhere around Twin Lakes that he wanted to stop running and the pacer allowed him to drop out. A running joke was that all three of the pacers Bill would have would need to do a better job than “that guy.” With this in mind I considered what condition Bill would be in upon his arrival. Time continued to pass and we kept waiting. A gradual tension grew as one of the crew and I discussed what may be happening. We agreed Bill must have slowed down and would probably not be in great shape when I began running with him. We tried to have this conversation out of ear shot of Bill’s wife, Naomi, in order to not scare her any more than necessary. Right before 5pm on Saturday, Bill arrived in Winfield after running for 12 hours 58 minutes. Unfortunately, when I saw Bill the team’s suspicions were confirmed as the trip through Hope Pass had taken a considerable toll on him mentally and physically. Upon greeting Bill I did my best to take in as much information as I could to access the situation. Bill stated that he had “No brakes, I can’t go up, I can’t go flat, I have first gear and neutral. I can run fast downhill. That’s it.” Besides being in considerable discomfort, Bill confirmed that he did not feel well. We set out on our journey back through Hope Pass and I began to test Bill’s systems. First I tested how much or little he could actually jog. We did some stints of running and walking that seemed to go well. Bill seemed pretty capable of pushing for half-mile segments, so my goal became to get as much running during a half-mile as possible, and then to allow walking and running during the second segment. This worked very well, and we actually ran a considerable amount in the first three miles, before reaching the climbing portion. Bill had taken in soup and other nourishment in Winfield, and the combination of nutrition and company seemed to spark some pep in him. As we began our ascent back over the toughest section of the course, I applauded Bill’s effort and urged him to get near other runners before the trail narrowed. This proved to be critical as we latched on to a woman and her pacer who had also just begun to climb. Both were using hiking poles and were moving at a quick walk, slow jog pace. I urged Bill to follow me, as they were moving at the perfect pace, and we should work with them. After following them for about a half-mile we struck up a conversation and learned that this was her second attempt at Leadville. The previous year she had been unable to finish. Although the pair was moving at a good pace the woman seemed uncertain whether she would be successful this year. I assured her that if she continued moving at the pace we were going she would be successful. I joked that I had performed a “Lazarus miracle” on Bill and brought him back from the dead back in Winfield. Not only would he finish but we were going to get as close as possible to 25 hours! Due to the kind words and insane statement I made, the woman’s pacer turned and offered her hiking poles for Bill to use. Immediately Bill petitioned against using the poles because he hadn’t practiced with them but I insisted, reasoning the poles would distribute his weight in a way that would help his legs considerably on the climb. This stroke of luck turned out to be critical to a successful ascent up Hope Pass and the four of us worked together for the next several miles. After reaching the high point of the course I began to realize the significance of our undertaking. As I turned to take in the beauty of the mountains, I felt a pang of dizziness and lightheadedness. Realizing that the altitude and exertion could be enough to cause me to pass out if I was not careful I quickly steadied myself, focused on looking forward, and asked Bill how things were going. I requested the hiking poles from Bill and returned them to their owner. After thanking the duo immensely and wishing them the best of luck, I turned to Bill and said “OK you said you had no breaks and could run downhill fast. You did well up the climb, but it still slowed us down, and we have to make up time to finish in 25 hours. So let’s see how fast you can go.” From there we made the first descent quickly to a mini aid station where I urged Bill to take in more soup and liquids. After a quick break we began the full descent of Hope Pass and the return to Twin Lakes (inward 61 miles). By this point the nutrition seemed to be hitting Bill’s system and his spirits had also lifted dramatically as we picked up the pace. It actually seemed as though Bill were enjoying himself for the first time in miles. I noted that we had passed a considerable number of people to this point and wanted to see how many more we could catch. It also occurred to me that we were making great time and it was possible we would arrive at the next aid station prior to the rest of the crew. Because we didn’t have cell phone service I had no way of alerting them. The best case scenario would be that they would be waiting for us and our surprise early arrival would be just what Bill needed to get him through the next segment. The alternative scenario would be that we arrived early and I would then have to make a decision. The first choice would be continuing on alone with Bill and hoping that they would figure out what happened in time to meet us both at the next aid station. The second choice was I would send Bill on his way alone and wait for the crew to arrive. Neither seemed appealing as there were considerable risks involved in both. Luckily, the crew was just setting up when we arrived, much to their surprise! With things not completely setup and not all of the crew members prepared for Bill’s arrival, I gave a quick rundown about what had transpired over the previous 12.5 miles. It was close to 9pm and almost completely dark as we walked Bill over to replenish himself with food and more soup. As we were putting the finishing touches on Bill’s night pack and headlamp, the second pacer, Dan, arrived prepared to take off. As they departed, I stressed that we needed to keep Bill moving and nourished – we were following a new time schedule. I gave the crew a description of what had happened. Everyone was excited and we began to plan the updated logistics. With Bill moving more quickly, and now on pace to potentially run 25 hours, we decided it was best if I paced the third section of the course instead of Matt. This is another 12-mile stretch that would bring Bill back over Sugarloaf Pass, the second highest section, and down through a rough, technical portion. Before heading over, we got food for everyone in the crew. We checked the race updates, Bill had moved from 400th place at Winfield to 299th at the top of Hope Pass, and then to 232nd at Twin Lakes. In the previous 12 miles, Bill and I passed 168 runners – “we passed A LOT of people out there!” I got an hour’s sleep in the car while we drove to the next meeting spot. When we reached Outward Bound heading inward this marked 75 miles. We congratulated Bill as he now exceeded his previous longest effort of 72 miles. We noted that although there was still a lot of race left things looked very good. Bill’s spirits were high and he continued to keep passing people and moving quickly. He was now in 168th place and had passed an astonishing 232 people since his low point in Winfield. Heading out from an aid station. I reminded him that we would have our work cut out. Bill had responded so well that he had a legitimate chance to finish in 25 hours and place in the top 100. He would need to complete the second half in under 12 hours, two minutes to break 25 hours. This required that he average 15 minutes per mile over the final 50 miles; no small feat given that the pace slows significantly with steep climbs or technical trails. During a race such as this, all aid station stops though necessary to replenish depleted nutrients, add time to a person’s finish. We needed to average 14-15 minutes per mile pace on the difficult sections, and speed up to 10-12 minutes during the easier portions, to offset aid station time and the slower first half of the race. Our first two miles took us took us onto a paved road and we had no trouble running the faster pace. Bill was in good spirits but the significance of a 100-mile trail run was beginning to show. He was beginning to look disoriented, although he was still able to give appropriate or witty responses, indicating his mental faculties were still intact. Bill also began to complain more about being tired, having gastrointestinal issues, and in a general state of pain and discomfort. Nutrition and replenishment of electrolytes would be of utmost importance in this final stage of the race. I sympathized with his GI issues but stops would be costly timewise. I also emphasized power walking at a minimum and jogging for 40-60 seconds in between power walks. On the tiredness and pain front, I reminded Bill that he’d just covered 80 miles, and would need to another 20 to finish. If he wasn’t feeling tired and in some dull paint, he wasn’t normal. Two miles in we reached Powerline, a carriage road that climbs 500 feet per mile for FOUR miles to 11,500 feet – with high voltage powerlines overhead. Not a single person had passed Bill in the second half of the race and I planned to keep that streak going. While I sympathized that climbing was painful, I reminded him to consider why he was running, that completing the run in under 25 hours was a possibility, and that he was capable of more than he thought. He assured me that I was crazy, and in his now barely audible voice, called me a slave-driver a few times and several other things. Bill conceded that he was feeling better than expected, and because what I kept asking him to do was working, he would continue to do whatever craziness I asked. For an hour we endured the ascent up Powerline in the cold dark night. There was a constant buzzing and an intermittent pop on the lines, which accompanied our footsteps as a soft drizzle had begun to fall. With the climb and increase in altitude our pace had slowed significantly so we were averaging 17 minute miles. According to the grade-adjusted calculator on Strava these 17 minute miles required closer to a 10-12 minute effort. As long as Bill reached the top in good spirits, we could replenish at the mini aid station and run 10-11 minute miles down the mountain to even out the pace. We continued to pass runners but the distance at which we came into contact with other people began to lengthen. I told Bill he must be close to the top 100 at this point. At 1:30am we crested the top of Powerline and entered one of the more bizarre sections. The course opening was completely illuminated with glow sticks along the ground and hanging from trees. A faint smell of soup and marijuana (it’s legal in Colorado) greeted us. We were the only runners stumbling into the aid station so I brought Bill over to the table and requested warm broth and Coke. Both were eagerly presented to us and as I handed cup after cup of broth to Bill I scanned the table. In addition to the soup there was Coke, Ginger Ale, crackers, marijuana, and three or four different brands of whiskey available. I jokingly asked Bill if he wanted a shot of whiskey. Our descent went just as planned for the first two miles as we clicked off an 11 then 10 minute miles. At this point we rounded a turn and made a critical mistake. Instead of going across the road and into the woods we took a sharp right and continued barreling down the dirt road. Happy with our pace but a little confused we both took note after a half to three quarters of a mile that something seemed off. We could not make out any course markers, glow sticks, head lamps, or sounds that were familiar with the course. Besides our headlamps we were in complete darkness. We stopped to gain our bearings and discuss the situation. As we both looked up the hill from which we had run, it was unspoken that neither one of us wanted to run back up the mountain we had just come from, for another half mile or more. The thought of continuing downward only to get lost was even more unacceptable. Our predicament was worsened by the fact that we had no cell phone or walkie-talkie to communicate. We stood in the road peering up into the darkness and waited for several minutes in hopes that we would see a head lamp barreling towards us. When this did not happen we became more convinced we needed to backtrack our route. In an epiphany, Bill stated we could turn on the “map back” feature on his watch. The watch would load and retrace his steps to tell us if we were headed back in the direction from which he had come earlier the previous morning. The watch confirmed our suspicion and we began the trek back up the mountain to where we had veered off track. Of the two of us I was clearly more irritated by the detour than Bill was. Bill reminded me it was a trail run, in the mountains, at night. There was a potential to get lost and he was simply happy we corrected our mistake. As we entered the final two miles of my leg with Bill I reminded him that it would be important to keep his spirits up and push when he was capable. This proved difficult as we had entered a technical stretch and neither of us was moving quickly. Bill began to complain that he felt as though he were bonking, to which I reminded him that he had now run 87 miles! What I was more concerned about was that I told him I too felt as though I were bonking. And given that I had accompanied Bill for nearly a marathon (26.2 miles) worth of running over rugged terrain at altitude, for the past 40 miles of his race, it was with good cause I would be bonking. We entered the final transition zone at May Queen within 20-30 minutes of redirecting our course mishap. This marked 87 miles, and with our mistake Bill was now closing in on 90 miles worth of running, and would need to complete 13 more miles for a total of 103 miles to finish. The timing checkpoint indicated that Bill had passed an additional 59 people to move from 182nd to 123rd place overall. Bill had passed an astonishing 277 people up until this point and it seemed plausible that he could move into the top 100 by the finish. After transitioning Bill, I was alerted by our crew member Doug that the car was parked approximately “10 minutes” away, back in the direction from which I had just run. A combination of bonked and understanding that 10 minutes probably meant closer to 20-30 minutes (or two miles) grated on me a little. I reminded Doug I was tired, cold and hungry, to which he replied “we have everything in the car to take care of that!” Indeed, when we arrived at the car I changed quickly into dry clothes, and Doug produced an insulated sleeping bag for me to wrap with. I quickly ate some food and we cranked the heat up. Within minutes I was asleep, while Doug drove us to the final meeting spot, only a mile from the finish line. All done! Matt Turek, Douglas Peckham, Bill, Naomi, Tom O’Grady and Dan Connors. A little past 6am on Sunday, slightly more than 26 hours after the race had started, we made contact with Bill as he and pacer Matt entered the last mile of the course. Bill would not be breaking 25 hours this year but he would be finishing. And with Bill in good spirits and passing people right up to the finish it would be an epic race to say the least! Our crew joined Bill, and Naomi called their sons Max and Liam to talk with him, as he crossed the finish. 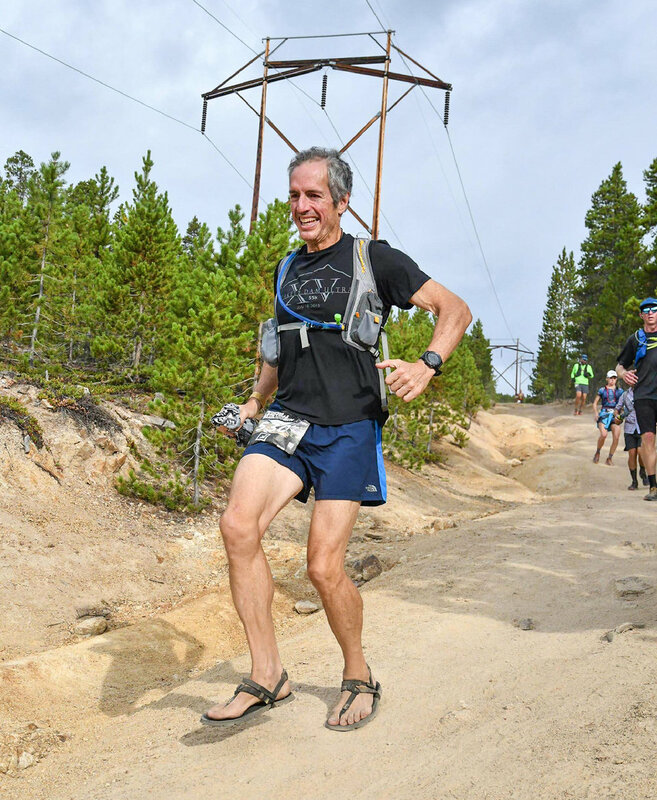 At 26 hours, 22 minutes and 28 seconds, Bill became the 109th runner to finish the 2018 Leadville Trail 100 Run. He had completely turned things around after reaching a low point at 50 miles and over the second half of the race had run a nearly even overall split. This ability to push and run, even after being so depleted, allowed Bill to move from 400th to 109th overall in the race. Let that sink in for a minute – Bill passed 291 people over the second half of the race (closer to 53 miles due to our wrong turn) without anyone passing him! There is a saying that running a 100-mile race such as Leadville can be compared to life. You start out a little quick and will certainly hit bumps along the way. At times the bumps will throw you off course. But for those who persevere you will be rewarded, not only with a sense of accomplishment, but a series of stories that have defined the path you took. The directors of Leadville say that you will give the race respect and in turn earn respect from the race. For Bill the parallel could not have stood out more. He reached the midpoint of his life as a success. By all measures anyone who has started a successful business and is taking care of a family should be proud of what they have accomplished. Like many on the path of life, Bill had also reached this midpoint with a faint sense of something missing, and an understanding that he may have let his health and physical activity take the passenger seat. In response to this, he did a total revamp on his life and began to accomplish things in his 40s and early 50s that individuals decades younger have difficulty doing. Bill commented several times upon finishing on how precisely things had worked out in his favor this year. He attempted to gain entry into Leadville in 2017 but was not accepted. Bill conceded multiple times that if accepted into the 2017 race he didn’t think he’d finish. Not only did he finish the 2018 race but did it in epic fashion. He pulled off that performance wearing nothing on his feet but a worn pair of LUNA Sandals. The same type of sandals described in the book, Born to Run, that he read eight years before. The same type of sandals that were being highlighted by a film “Born to Run” that was being filmed in part during the race that he had just finished. To culminate things, Bill had been anointed by one of his running idols Barefoot Ted, into a select group of people that live the lifestyle embodied by LUNA Sandals to the fullest extent possible. He remarked that the irony of me pacing him, and the circumstances of how we met, could not have been any more fitting. He had begun running at a point when my running was at a high point. He joked that it appeared I had won every single race he entered for the better part of 2011 or 2012. I assured him this probably wasn’t true but those years had been very good to me competitively. When I met Bill at the end of 2017, his running was in full swing, and my competitive days seemed to be behind me. After not running for nearly two years, due to tearing my Achilles tendon in January 2016, my first several runs (hikes) with Bill were highlighted by the fact that someone who I least suspected would be pushing my fitness level back in the right direction. Bill is simply a good guy who adopted a great lifestyle. Running had become as much a part of his life as it had mine. It was a positive force that drove him forward even when the going got tough, and in addition to other aspects of his life, challenged him and kept him honest with himself. Bill’s preparation and attitude prior to the race were second to none. He enjoyed going out on training runs that most people would find punishing. And when things got tough during the race, or we took a wrong turn, Bill conceded without hesitation that it was all part of the undertaking. Thomas O’Grady (thomas.james.ogrady@gmail.com) of Slingerlands is an avid runner, hiker, and lover of the outdoors. He’s a public health expert by training. With a lifetime of racing experience, Tom is USATF and Jack Daniels certified to coach distance runners and endurance athletes.